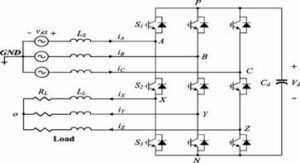 In this paper, the switching cell concept is extended to isolated ac-ac converters, and a highly reliable double step-down ac-ac converter is proposed with high-frequency transformer (HFT) isolation. By using the switching cell structure and coupled inductors, the proposed converter has no commutation problem as it is immune from both short-circuit and open-circuit problem, even when all the switches are turned-on or turned-off, simultaneously. Therefore, it does not require PWM dead-times along with bulky and lossy RC snubbers or voltage sensing circuitry to implement soft-commutation strategies; resulting in high reliability and high quality output waveforms. The HFT in the proposed converter provides electrical isolation and safety which is required in applications such as dynamic voltage restorer (DVR) and solid state transformer (SST), etc., without the need for external bulky line frequency transformer. Moreover, all the passive components experience twice the switching frequency, therefore, their size can be reduced. The proposed converter is very suitable for application as DVR, to compensate both voltage sags and swells, owing to its ability to provide both inverting and non-inverting outputs. A detailed theoretical analysis and operation of the proposed ac-ac converter are provided, and its applications as DVR and SST are also discussed. Experimental results with scaled-down prototype are also provided to verify its performance. Fig. 1. Circuit topology of the proposed HFT isolated double step-down ac-ac converter. Fig. 2. 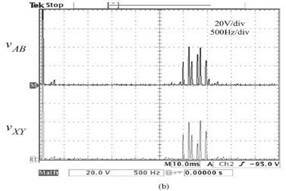 Input voltage, output voltage and current waveforms for: (a) Non-inverting mode operation. (b) Inverting mode operation. Fig. 3. Capacitor voltage waveforms for: (a) Non-inverting mode operation. (b) Inverting mode operation. Fig. 4. Voltage waveforms of: (a) Input voltage, and switches voltage stresses. (b) Zoom in waveforms of (a). Fig.5. Experimental results of switch voltage and winding current stresses: (a) Winding current and switches voltage stresses. (b) Zoom in waveforms of (a). Fig. 6. Experimental results of switch voltage and winding current stresses: (a) Transformer secondary winding current and bidirectional switch voltage stresses. (b) Zoom in wave forms of (a). 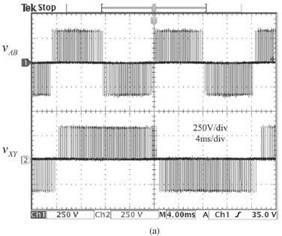 This paper proposed a very robust high frequency transformer isolated double step-down ac-ac converter with both non-inverting and inverting operations. The proposed ac-ac converter uses the SC structure with CLs at primary side, which make it immune from both short-circuit and open-circuit problems, even when all switches are turned-on or turned-off, simultaneously. Therefore, the proposed converter is highly reliable as it has no commutation problem. 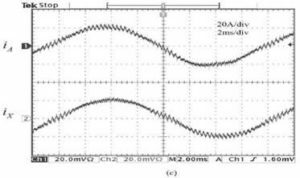 Moreover, it does not need any PWM dead time along with RC snubers or soft-commutation strategies by sensing voltage polarity. The proposed converter provides the electrical isolation and safety with HFT, thus, it eliminates the need of external bulky line frequency transformer, in the applications such as DVR and SST, etc. The size of all the passive components in the proposed converter can be reduced, owing to fact that they experience twice the switching frequency. It has both non-inverting and inverting operations which are utilized to compensate both voltage sags and swells in its application as DVR. The operating principle and circuit analysis of the proposed converter is explained, and then, the structures of DVR and SST are developed based on the proposed converter. A scaled-down prototype is also fabricated in laboratory and experimental results are given to validate its advantages. Liu, B. Wu, N. R. Zargari, D. Xu and J. Wang, “A novel three-phase three-leg ac-ac converter using nine IGBTs,” IEEE Trans. Power Electron., vol. 24, no. 5, pp. 1151–1160, May. 2009. B. Jacobina, I. S. d. Freitas, E. R. C. d. Silva, A. M. N. Lima, and R. L. d. A. Riberio, “Reduced switch count dc-link ac-ac five-leg converter,” IEEE Trans. Power Electron., vol. 21, no. 5, pp. 1301–1310, Sep. 2006. 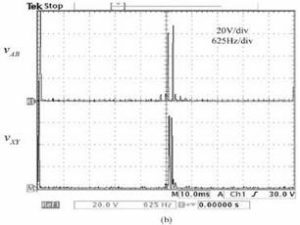 Alemi, Y.-C. Jeung, and D.-C. Lee, “Dc-link capacitance minimization in T-type three-level ac/dc/ac PWM converters,” IEEE Trans. Ind. Electron., vol. 62, no. 3, pp. 1382– 1391, Mar. 2015. 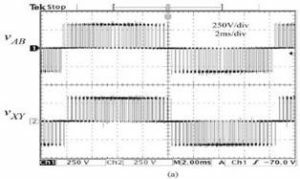 W. Kolar, T. Friedli, J. Rodriguez, P. W. Wheeler, “Review of three-phase PWM ac-ac converter topologies,” IEEE Trans. Ind. Electron., vol. 58, no. 11, pp. 4088– 5006, Nov. 2011. Ecklebe, A. Lindemann, and S. Schulz, “Bidirectional switch commutation for a matrix converter supplying a series resonant load,” IEEE Trans. Power Electron., vol. 24, no. 5, pp. 1173– 1181, May. 2009.